.......... Sam’s persistence and reassurance, as well as his knowledge of performance techniques, were instrumental in my growth as a performer. Without Sam and his workshops, I doubt that I would have worked up the courage to perform and I especially doubt that I could have improved those skills as much as I did. I know that the guitar will occupy a special place in my life going forward, and I give Sam much of the credit of that fact. I do not know what more one can ask of a teacher." "Sam is outstanding. He takes the time to understand what you want out of the lessons, and really tailors it to help you get there more quickly, while keeping it fun and interesting. He also goes way beyond just the guitar too, coachingsongwriting, performing, equipment, vocals and just tying everything together in a way that gave me even greater appreciation for the music I love. And, he's just such a good dude. Seriously one of the most genuinely great guys I know." “Before going to Sam, I had absolutely no musical training or even experience playing any instrument outside of playing Rock Band. I decided I wanted to learn to play guitar, so I asked a composer friend of mine if he had any recommendations. Sam has been working with me for 3 years now, teaching me everything from musical theory and why a song has the notes it does, to how to really perform up on stage and in front of friends. He's hired Grammy winning musicians to play in a band just to give me experience playing. He went out shopping with me for my first guitar and my second... and probably my third. He gave me free voice lessons on the side to make sure I was really prepared for my first show. He works with completely inexperienced people like me and with professional musicians who have been working for 30 years and just want more insight into how to make their show better. He's fun and really cares about his students”. “Sam Druckerman's performance workshops are by far the most powerful and effective tool for improving performance techniques that I have ever come across!! Whether you just learned to play guitar last week, or whether you've been on the road touring for 20 years, he will help you. 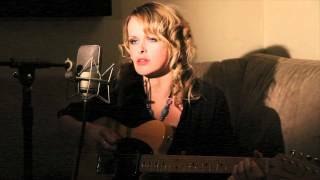 I started going to the workshops over a year ago, and it has really opened my eyes and my mind as far as my performance techniques while on stage.I've always focused mostly on the music - songs, guitar playing and my voice, but sometimes you let your performance take a hit, and lose the engagement of your audience. It's very important that a performer conveys the right emotions and intensity on stage in order to captivate his/her audience. Sam has an incredible gift for teaching just this. He's an all-around expert. He'll help you step up your game with your performance as well as guitar and vocal technique (he's a classically trained vocal coach and an incredibly seasoned guitar coach). He will teach you how to engage your audience and convey the real emotion in the music you are playing. He has an incredible insight into what you need to reach your goals, and he'll be very honest (yet kind) in telling you just how you can get there. This is a very unique opportunity if you're a musician/performer. I don't normally write yelp reviews but I wanted to share this because I am blessed to have come across Sam. The workshops allow you to break barriers while performing infront of a small, supportive audience. Each member of the workshop improves so drastically.. it is amazing to be a part of the process, and to see first hand the difference even a little training makes! Los Angeles is a competitive, cut-throat city and these workshops will teach you how to stand out amongst the crowd. Song Writer, Recording Artist, Vocalist, Musician. “I have been a professional musician and songwriter for many years. I found that I was singing more and more, and slowly getting better, but I wasn't enjoying it as much as I wanted to, because I didn't feel very confident about my singing, and I didn't really know what I was doing. I started going to Sam Druckerman for voice lessons and things really began to open up for me. I started to love singing, and began to feel confident even when I was working with much more experienced singers. Sam makes his students work hard on supporting their voice and putting the note where it's supposed to be. Sam uses simple concepts to help you achieve a big, vibrant tone, and intense exercises to increase stamina and improve intonation. As a consequence, my confidence and enjoyment have increased, and I have been able to deliver to my full potential. I heartily recommend Sam”. Song Writer, Vocalist, Musician, Recording Artist. “Sam Druckerman is without a doubt the BEST quality guitar teacher/performance coach in the LA area, and most likely all of California; and he's right here in Brentwood! I have paid for guitar lessons in the past, and NOTHING compares to the level of teaching that Sam can offer. He has even coached PROFESSIONAL MUSICIANS on the stage at his workshops. What I'm saying is, Sam is more than capable of helping you reach your goals weather you're already an intermediate to advanced guitar player, or you just need help getting started, Sam is your best choice hands down. 1) Lessons are one on one-- he is completely devoted to you and your interests alone for the entire lesson. 3) He has Lots of experience. Not just as a musician, but as a teacher. His techniques will help you reach your goals QUICKLY. 4) He teaches voice too! I actually had NO IDEA that I had a singing voice when i started with Sam. I went through a lot with it, but now I can sing AND play!! HOW HOT IS THAT?? Hahaha! I can actually say that my experience with Sam Druckerman and SunPath Music has changed my life for the better, and I highly recommend him”. “I met Sam at one of my gigs after I had just started singing. 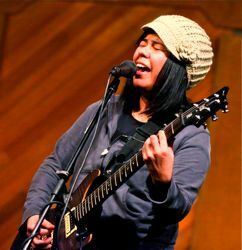 I'd already been a touring guitarist for years and had an all instrumental CD to my name, but I was feeling unsatisfied with my early attempts at singing. Taking vocal lessons with Sam gave me the confidence to let 'er rip. Sam stresses breath control and placement, with very specific exercises (to do with him and on your own) to improve, not just some "c'mon, try harder" mumbo jumbo. It's hard to imagine a better teacher than Sam. I'm about to release my fourth vocal CD this summer, a direct result of Sam's teaching methods. I've also taken part in a few of Sam's performance workshops and have seen the incredible improvement his guitar and voice students have made. It's inspiring to see students, whether they're absolute beginners or pro's, grow so fast. Oh, and Sam makes it fun too! Highly recommended”. 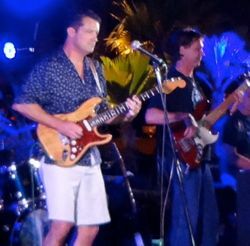 “I have been working with sam for about a year now and my guitar playing has rapidly improved. Every time I show up theres something new to learn--the right way. At first I was hesitant to even play someone a song, now he has me playing,singing and performing with not half of the anxiety and nervousness I would get performing for anyone. I have had a lot of teachers, most were great players but they simply could not teach it. Sam is not only a great player, but he is a master teacher. I highly recommend you work with him if you are serious, or just want to learn it the right way”. “Let me just start by saying that Sam Druckerman is an amazing vocal coach. He has not only taught me the fundamentals of singing and performing but also the determination and strength that it takes to improve both of those. When I first started taking vocal lessons from Sam I knew he meant business. I was so excited to be working with someone so determined to see me improve. I learned so much from Sam. When I first started performing I was a nervous wreck. I loved to sing and play the guitar, but my stage presence was terrible and I knew it. Sam knew exactly what to say and how to help me out of that. I can't express how beneficial the performance workshops are. He is a very motivational teacher and he doesn't give up on you. I've taken so much from what Sam has taught me and use it still to this day. I now give vocal lessons of my own and I make a living singing/performing at least two times a week. I owe a lot of my success to Sam and I am so thankful that I had the opportunity to work with him”. “If you want music to be part of your life, Sam should be part of yours. Sam isn't just a guitar teacher or something like that. Sam is an ambassador to the multifaceted world of music. I found Sam looking for a guitar teacher, next thing you know he's teaching me how to sing. After that he's teaching me music Theory, after that we're learning the process of a great performance. If you want to learn to play guitar for your kids, go see Sam. If you want to start a rock band and "start a revolution from your bed," go see Sam”. “I have had the pleasure of taking these workshops for the past 6 years and I can say that they are single handedly the reason I am working as a musician today. Quick background. I was a kid interested in learning how to play the guitar found a really good teacher, one thing lead to another and I started my first band in 2005. It was fun a way to hang out with my friends and have a blast. As time progressed I decided to make a real run for it. I had no idea what that entailed, so I called my mentor Sam. He invited me to my first workshop, from that moment on I knew this is what I was going to do. It was no walk in the park, but the super friendly and comfortable environment was a perfect spring board to start playing in public. There were people of all talent levels there, from blistering pros to first timers and we were all in it together. Flash forward to 2012 and I am headlining the Viper Room tonight to a sold out crowd, enjoying my life as a professional musician. 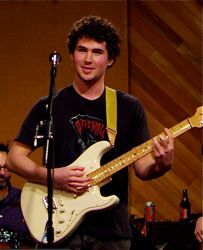 "I've been a student of Sam Druckerman for four years and my voice, guitar playing, and all-around performance skills have improved vastly. Sam doesn't just teach you how to play music. He teaches you how to be an artist. His background in theater brings a deeper dimension than you will find with other instructors. One lesson with Sam and you will discover that teaching is his top priority. 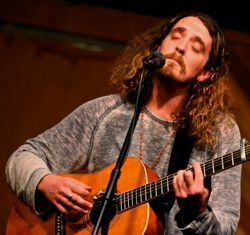 The combination of private lessons, performance workshop coaching, and support in "real world" open-mic performances make Sam an awesome choice for guitarists, vocalists, songwriters, or any combination thereof." Lou Thomas. Supervising Sound Editor at Warner Bros.
“If your tool of choice is an ax, guitar hero, then do I have the guy for you. Sam's been my guitar instructor for almost two years now, and he's always been patient and customizes the lessons to my level of preparedness (or unpreparedness, as the case may be). Lessons with Sam are always about learning while having fun and, unlike some other "teachers" who has nowhere near the experience Sam has in teaching but are probably just doing this "on the side" to supplement their gig at the music store, Sam makes his living doing this. He's played in bands and knows his music. Most importantly, he cares about his students and just LOVES to teach, even going so far as to putting together workshops where he will rent out a studio and allow people to try out their performance skills”.